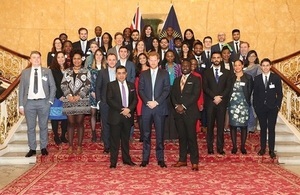 Lord (Tariq) Ahmad, Minister of State for the Commonwealth and His Royal Highness The Duke of Sussex, the Commonwealth Youth Ambassador, met with 30 young people from across the Commonwealth in London today. At the Commonwealth Heads of Government Meeting (CHOGM) in April 2018, the UK announced more than £500 million in funding to help deliver the summit’s commitments during its period as Chair-in-Office. This included a range of projects with a specific youth focus, recognising that 60% of the population of the Commonwealth is under 30. We will only succeed in delivering the vision for the Commonwealth agreed in April 2018 if we listen to the views of young people; they must be at the heart of our collective effort. On education, we are delivering projects worth over £200 million in nine Commonwealth countries to enable 12 years of quality education for girls and boys. We are helping to create 150 new Queen Elizabeth’s Commonwealth scholarships for talented students by 2025. On trade and political inclusion, we are making concrete steps too. We recently supported the 2nd Annual Youth Business Forum in Uganda, bringing together over 300 youth entrepreneurs to influence the national youth legislative agenda, and in March we are planning an Africa regional conference on youth inclusion. And on our environment’s future, our co-leadership of the Commonwealth Clean Oceans Alliance with Vanuatu, and our Commonwealth Marine Economies programme, are helping to protect our oceans and the communities that rely on them. I’m delighted that His Royal Highness was able to be here as Commonwealth Youth Ambassador, and to speak about his inspiring work to champion the youth of the Commonwealth. At the event, the Minister and Duke of Sussex heard from Dr Elvis Eze, co-founder of the Commonwealth Youth Health Network and Youth Ambassador for Malaria No More. He also met with Tijani Christian, Chair of the Commonwealth Youth Council. Dr Elvis and Mr Christian shared their experience of advocating for the views and perspectives of young people across a range of issues.